Sylvianna is no ordinary real estate agent. Her genuine care, honesty and understanding of people has allowed her to stand out from the realtor crowd and exceed many clients’ expectation. It’s no surprise that everyone who had the opportunity of dealing with her has nothing but positive reviews to say. Click here to read all the amazing reviews for Sylvianna! 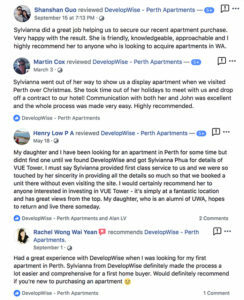 Hear all about Sylvianna Phua’s interview with MostWA as she shares her journey into Perth’s apartment market. So, you’ve been in Perth for a little over a year now. Why did you make the move to Perth? Yes, September marked my first year of living in Perth! I’m originally from Sabah, Malaysia (Kota Kinabalu) and worked as a sales & marketing manager for a local developer for five years. 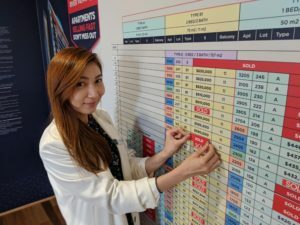 At most, I could sell more than 10 high-end apartments in a single day. I took part in the planning & development of significant projects and was heavily involved as an executive in the company. As I was getting married last year, me & my husband thought about what our future plans were going forward. When the opportunity to live in Australia suddenly came along, it felt like the chance of a lifetime. I’ve visited Perth once three years ago, and I remember being really drawn to Perth’s always-sunny weather & the lifestyle just naturally appealed to us. Perth also has some of the most beautiful beaches & open green spaces, so we looked forward to spending most of our time in parks & café strips. 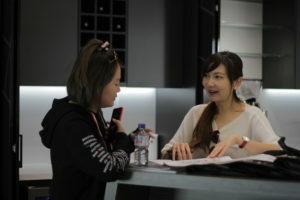 But the problem was, other than a few relatives, we didn’t have any friends or working experience in Perth. So the first few months was definitely tough. Everything was unfamiliar to me. We were comfortable and financially well-off living in Malaysia. And for us to leave everything behind & start over was a big risk. But I knew that if I don’t take on new challenges, there’s no room for me to learn & grow. So we made the decision to move to Perth for a fresh start. How did you settle into your new workplace? I was really fortunate to meet my managing director, John Woon from DevelopWise. At first I was unfamiliar with the culture & especially the language. But John still took a chance and taught me everything I needed to know about the Australian real estate industry. The team also played a big part, they’re basically family. We have a motivated, ethical and professional team that shares the same values and working culture which allows us to work very closely and effectively with one another. 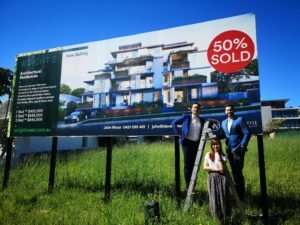 The real estate industry in Perth is really competitive, how do you differentiate yourself from competitors? I’m always positive, patient, and sincere. We really listen to what our clients need, it’s not about pushing properties to people. Everyone’s different and I always tailor my approach to different people. Being multilingual, I can speak Mandarin, Malay, English, Cantonese and Hakka which enables me to speak with clients of different nationalities. When I talk to potential buyers in their first language, they feel relaxed and comfortable to talk on a more personal level. This is incredibly helpful for foreign buyers who can’t speak English & allows them to understand the full picture of buying a property. As a team, we always go above and beyond to ensure the best possible outcome for every client and every property entrusted to our care. As a result, we continually exceed people’s expectations when it comes to providing professional advice in sales and property management. We don’t see selling apartments as just business transactions, we genuinely care about our clients and we’re committed to building trusting and lifelong relationships. Our strong and carefully nurtured clientele enables us to find the right buyers for the properties entrusted to us. The results speak for itself: high retention rate of tenants and landlords, repeat customers and wonderful testimonials and word-of-mouth from all our clients.